Congratulations to Nisha Roy on winning our thirty sixth High Five Giveaway and thank you to all who entered! 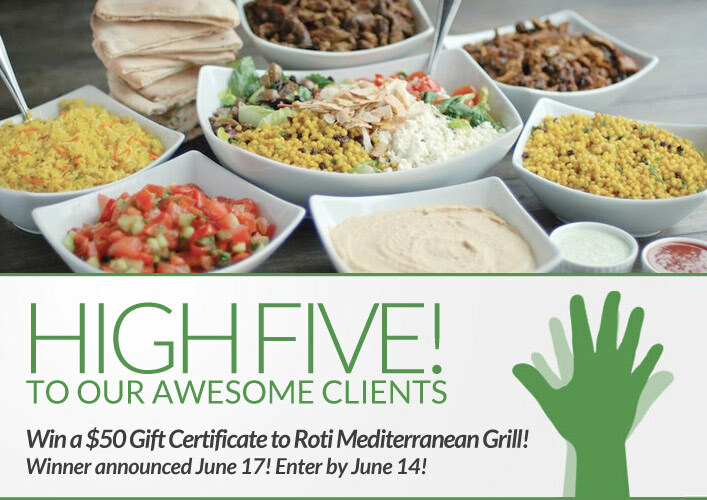 Our next giveaway is for a $50 gift certificate to Roti Mediterranean Grill. Inspired by a love of the Mediterranean experience, Roti set out to bring the best of this region to our own neighborhoods. The core of their menu—pitas, cous-cous, fire-roasted meats and hummus —have endured for hundreds, if not thousands of years. These are not just scintillating tastes and ingredients that you love. This is food that returns your love. Food that makes you feel good long after you’re done eating. Food that rewards you with its great taste, good health and timeless beauty. Roti calls it Food That Loves You Back. Roti has five locations in downtown Chicago. Visit their website at roti.com or call them at (312) 263-9000. Summer is almost here! What is your favorite Chicago summer music or street festival? (Hint: There are no wrong answers! Now, just add a comment to this post with the right answer to be eligible to win! The winner will be announced on Monday, June 17. Entries must be received by midnight on Friday, June 14. I love the Puerto Rican festival in Humboldt Park. N Halsted Market Days- the best. Glenview Street Fair. Not in the city, but still fun, especially with kids. My favorite Chicago festival is the Chicago Jazz Festival. It’s a four day free celebration of jazz in Grant Park. It’s a great mix of people of all ages and it features all forms of jazz. I love it! Ravinia – Sitting out under the stars listening to top performers. Music Mondays at Pritzker Pavilion. Free shows with top acts such as Glen Hansard and The Carolina Chocolate Drops.